Washington (CNN) – Americans are far more likely to self identify as conservatives rather than as a liberals or moderate, according to a new Gallup poll released Friday. The state with the most conservatives in the U.S. for 2010 was Mississippi, with 50.1 percent claiming conservative political views. Gallup also reported that 50.1 percent is the largest majority ever seen in the three years they have conducted this survey. Other states, including Idaho and Alabama, came in close at a little over 48 percent each. The most liberal state isn't even a technically state at all. The District of Columbia topped the list with 41.1 percent espousing liberal political beliefs. Vermont was a distant second, with 30.5 percent. Not surprisingly, Gallup also reported that the more conservative states in the nation were congregated in the south and west, with their liberal counterparts on the east and west coasts. According to Gallup, "The top 10 rankings make clear that conservative identification is much more common than liberal identification." Each of the top 10 conservative states came in at over 45 percent, however, only the District of Columbia surpassed the 31 percent mark for liberals. And in every state, conservatives outnumbered liberals. The Gallup survey had a sample size of 182,538 adults. The margins of error for each state differed, between plus or minus 6 percent and plus or minus 3 percent. 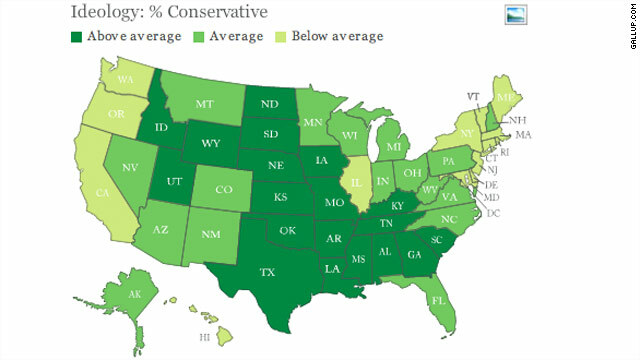 I would really like to see whether there is a corelation between the "most conservative" and least educated states. My guess is yes, there is but it would be interesting to see the numbers. Clay in Phoenix, but don't hold it against me! What they didn't tell you is the states where they are MORE? conservative if you add the population they come no where near being as populated as the states that have the most population. That's why the provision that gives these state electors and we don't elect with the majority votes of the population is absolutely wrong. My first reaction was "expatriation time!" but then I remembered that size matters not, regardless of what Texas says. Anyone else notice that the most conservative states are the ones with the lowest per capita income, Mississippi, and the lowest number of High School students going on to college? Same with the poverty statistics. Hum... what does that tell you? WOW - isn't it ironic that the so-called "MOST CONSERVATIVE" states are also the LEAST EDUCATED, POOREST and BIGGEST RECIPIENTS of GOVERNMENT HANDOUTS? I guess the survey did not bother to call people living in the poor areas - 95% of those states. –Though many of them are addicted to FOX News and Oxycodone. "The state with the most conservatives in the U.S. for 2010 was Mississippi, with 50.1 percent claiming conservative political views. " from the article. Mississippi state is also one of the poorrest in the states. Do you see the link? I don't care if they are conservative or liberal. The point is - are they willing to compromise? They need to be willing to listen to the other side and work with other Americans. We need to work as one country and understand that people aren't uniform in opinion. The survey fails to point out that the consevative movement has had success at vilifying the liberal label . This means that although people lean to the liberal side with thier ideologies they won't identify themselves as liberals. Its really a shame and has done more to divide this country. Remember you are an American first! Wonder how much time and effort was spent to show what was already widely known, Gallup must have been hired by the government for this poll. lol! Mississippi was ranked last among the fifty states in academic achievement by the American Legislative Exchange Council's Report Card on Education, with the lowest average ACT scores and sixth lowest spending per pupil in the nation. (from Wikipedia).